A simple and solid solution, P3D brings the old school sprites & poly 3D graphics to your Clickteam Fusion Windows applications, with a fresh and modern touch. Make your platformer, puzzle game, isometric adventure, first person shooter, architectural demos, interactive presentation, menus, whatever you can think of. 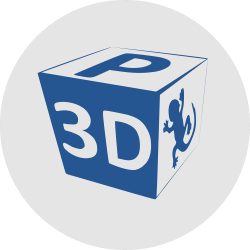 P3D is fully integrated in Fusion GUI: add objects to the frame editor, paint your textures in the animation editor, create and move elements in 3D space by drag and drop and manipulating alterable values/strings in the event editors. Wander inside zombie city and try out P3D in action, source code for P3D users available in the "Repository"
Source code in the repository! Wander inside zombie city, pave your road through hordes of absolutely pacific zombies and look at some nice water effect. Source code free to download! No setup, ready to go! - perspectively consistent, use any texture size and place it next to any other size, no more limitations! - fully customizable: made in Clickteam Fusion! P3D is a complete suite of events and objects allowing you to create 3D worlds directly in the frame editor, with the same Fusion interface you already know and no additional extensions, nor external assets, since you can build everything from scratch directly with the animation editor. To do so, it uses a pixel shader (now five new shaders specifically designed for P3D) for polygons deformations. P3D also includes all the events for movements and collision detection, with this tool you can have the good old “sprite & poly” games like Doom, Hexen, Ultima Underworld, but of course also modern-looking games (up to you and your textures!) or even use it simply for menus, or animated backgrounds, or as a zooming tool, or whatever you can think of. It all happens in its three layers (one for the interface, others the map, and the projection), so you can handle them the way you like more.